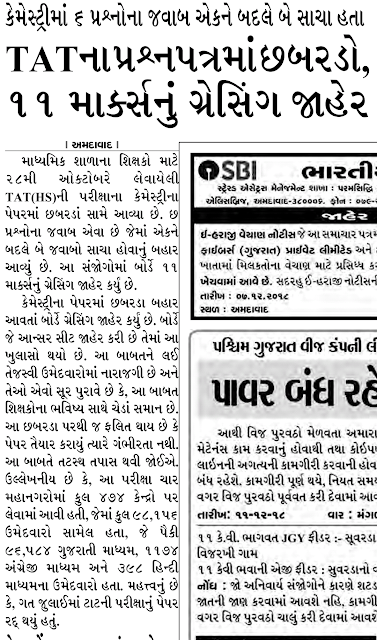 Home » Newspaper's News » TAT Na prashna Patra Ma Chabardo 11 Mark's Nu Geace News Report. TAT Na prashna Patra Ma Chabardo 11 Mark's Nu Geace News Report. In this section you can download the paper solution of This Aptitude test TAT-SEC 2018. soon the marks you achieve will be counted as a merit marks on the head teacher recruitment. So download TAT Answer key and check it and ping us if you find any incorrect omr answer or MCQ. In Below given image, all the answers are tick marked so that you can distinguish all the questions and mcqs properly. Also tell us your marks by comment section after checking and solving it so that in future we can prepare a probable merit of any recruitment examination. Also share the link of this post in facebook and whatsapp with the hash tag #TAT_Answerkey_by_govtjobbuzz_com. So that people can find it easily and more people can check this TAT mcq answer key and HTAT OMR paper solution.